"Persons without a valid visa will not be allowed to enter Norway," says State Secretary in the Ministry of Justice and Public Security Jøran Kallmyr. 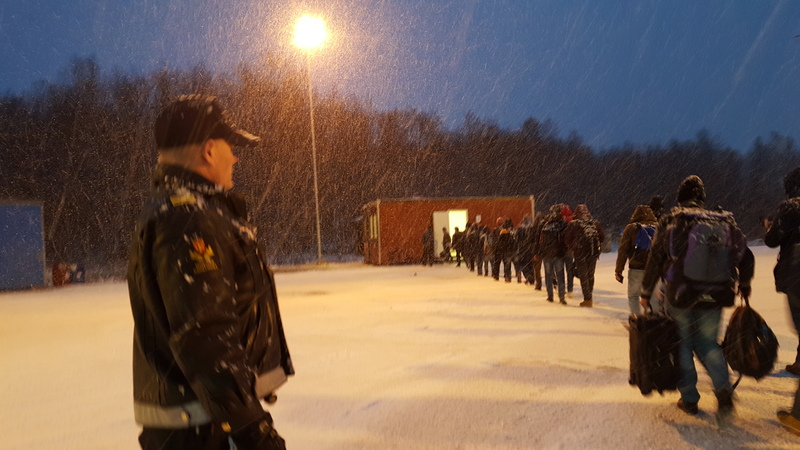 Yesterday, the Police in Finnmark in charge of Norway’s immigration control informed Russian Border Service FSB that no migrants would be allowed to cross the borderline unless they hold a valid visa to Norway or Schengen. This afternoon, police officers were placed on the borderline for identity check of travelers. In practice, it means the ID control on the borderline can stop persons from entering Norwegian soil. But, no migrants have arrived on Monday. Not one single. After months with a large flow of migrants it indicates that Russian border officials have not allowed any potential asylum seekers to leave the Russian checkpoint at Borisoglebsk. Chief of Police in Finnmark, Ellen Katrine Hætta, confirms to the Independent Barents Observer that not one single asylum seeker has arrived so far today. State Secretary Jøran Kallmyr will not conclude that the challenge with the wave of migrants entering Norway via the Russian north is over. “That is too early to conclude,” he says when meeting the press at the local police station in Kirkenes Monday evening. Ellen Katrine Hætta explains how the new regime works. What happens to a person that comes without having a valid visa to Norway? If the person says “asylum” 20 centimeters from the borderline, will the person be let over or will it be taken a decision there and then? “That is something we have not experienced yet,” Hætta says. Last Thursday, the Ministry of Justice instructed the Directorate of Immigration to reject applications from everyone with resident papers in Russia arriving over Storskog check-point. The challenge, however, is that Russia has rejected to take back 40 of the migrants that Norway has expelled. Jøran Kallmyr says to the Independent Barents Observer that officals from Norway on Tuesday will discuss the issue at meetings in Moscow. “We have expelled 60 persons from Norway. Russia has taken back 20 of them, but rejected to receive the other 40,” says Kallmyr. The State Secretary hopes the meeting in Moscow will find a solution, so the migrants Norway want to return will be accepted back again by Russian authorities. Experts on diplomatic relations with Russia from Norway’s Ministry of Foreign Affairs will participate at the meeting. Kallmyr says the situation now don’t requires the Minister of Justice himself to travel to Moscow to discuss the matter. Around 30,000 asylum seekers have come to Norway so far this year. Some 5,000 of them have travelled the so-called Arctic Route via Murmansk to the Norwegian border. Storskog checkpoint is the northernmost of all entry-points to the Schengen area. The first asylum seekers from Syria discovered the Arctic Route this summer, and since then a wave of migrants from more than 20 countries have entered Europe from the north. Hætta says the largest groups lately have been from Afghanistan and Pakistan.